" For as long as I can remember I have always loved the mysterious, powerful and eloquent world of Beauty ... and most of all perfume, especially when it is combined with skincare, then slides on our skins and inspires joy ... "
When I finished my studies, I joined a little perfumery company in Limoges, Shop 8. At the time, I had no idea that I would meet the future father of my children and that a tremendous story had begun to be written. As our company grew and developed, we bought Sephora from the Boots group, keeping only the name, and set up the new concept of a self-service perfumery. In late 1996 we opened on the Champs Elysées, which was both the culmination of our work and the beginning of the end, as Dominique decided to step down when he turned 50. The business was acquired by LVMH in 1997. After our new baby together, we gradually began to have more time for ourselves, and I started a new chapter – this time on my own – at the workshop on the rue Mouffetard in Paris. This time, it was about a new movement, a different way of using perfume, an elegant and gracious ritual that combined the origins of perfume with modern femininity. It is no longer about just scenting the skin, but rather giving perfume a new identity, a new body, a unique soul, and trying new things, researching, finding new paths to knowledge that have never before been explored. For a new adventure, a new name: "Crazylibellule and the Poppies", as well as a transformation from the traditional bottle to the very first "caress of perfume". Crazylibellule and the Poppies travels the world from its base in Belleville, again in Paris. A rather extraordinary bouquet of 28 fragrances, created and introduced into Europe, Asia and America. Personal circumstances brought the story to a close. After any upheaval always comes the desire to create, to innovate, to gather together what is left – resilience. I reinvented myself through a new company, densifying the heritage of my previous adventure. A more evolved brand, aware of new scientifically and ecologically needs, in coherence with human kind ... In 2014 I decided to partner with UPPERSIDE, a French family business, who would act as a solid and equal partner in my new entrepreneurial venture. Together, we would be able to evolve, develop and move forward. 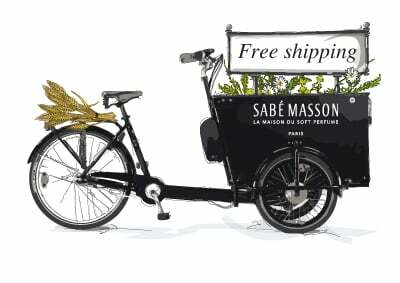 And so, the brand Sabé Masson - La Maison du Soft Perfume,was born. This marks the appearance of the first fragrance with a thousand virtues, the new Parisian Maison de Parfum, rich in unique expertise and remarkable in its difference. It was not long before we opened our boutique in France. In our studio, based in the heart of Paris, The , in the heart of Paris, it's just like a hive. The creative team reviews hundreds of options, from the designs and colors of forthcoming collections and new fragrances to the most delightfully natural and innovative compositions for the skin: new alchemy, new galenic formulas and the stories behind all these sensations. In preperation, a range of accessories to enhance our daily life, functional, useful objects, and beautiful "Sabé Lieux de Vie" home scents are all currently being developed. Take care of yourself, of your scent trail, of your skin – of everything that makes you unique. You are more than welcome to come visit us at our emblematic store in the haut Marais in Paris. A place that represents the brand's life force and environment , encourages discovery, pedagogy, knowledge of our cosmetic and olfactory mixtures. Our Soft Perfumes are available in solid Skincare Perfumes and Liquid Skincare Perfumes and are in the process of acquiering a Vegan certification. Our Softs Perfumes are first formulated in their solid form. Some of them will also become Liquid Soft Perfumes. These Soft Perfumes or "Skincare Perfumes" are the fruit of precise associations between the art of fine perfumery and natural cosmetic ingredients rich in virtues and respectful of the skin. Alcohol free, Paraben free and Paraffin free they link the pure emotion of perfume with the virtues of skincare. All our Solid Skincare Perfumes painstakingly designed, created, formulated and manufactured in France. They also make wonderful gifts, and in such circumstances are sure to surprise, spark intrigue, instigate conversation, and, of course, become highly addictive. Suitable for all skin types thanks to their alcohol-free formula, they will be enjoyed by all your friends. Whilst being agile in their solid format they will never leave you or your loved ones' sides during your adventures and travels. The liquid Soft Perfume is a unique, innovative and patented formula. Our Liquid Skincare Perfumes are alcohol free as well as being solvent free. Technology: Pure perfume waters and oils mingle together as micro-droplets (UltraDrops ®) imperceptible at vaporization. A technical prodigy for an incredible sensory restitution, respectful of the skin. Captured and protected in their precious black bottles, these particular molecules will bloom on your skin and your hair. The vaporization of this perfume nectar offers a feeling of refined olfaction in the manner of a great wine. The same perfume declined in Solid and Liquid versions is structured on the same olfactory composition. Liquid Soft Perfumes are perfumes of great delicacy, they exhale nature and softness while embracing you in their olfactory impression. These Liquid Soft perfumes are the new generation of perfumery. Solid Skincare Perfumes, Liquid Skincare Perfumes and new beautiful ways to perfume your skin and your hair. Our solid perfume can be taken everywhere and anywhere you wish to adventure to, while our precious bottles wait patiently for your return, enveloping you with their evolving and reassuring essences . Our founder talks of "sliding" your fragrance, slide it along ones skin to reconnect or seduce but more importantly, safely, since our fragrances are alcohol free, paraben and paraffins free and have "clean" formulas. There are days when everything gets to us... imperceptibly, but we always persevere, as if nothing had happened. At Sabé we advocate these moments of letting go, sweet fleeting moments in our overbooked days, where for a minute, just one minute, we can escape, one minute when everything can slip off us, one minute distanced from any pollution, one minute to be attentive to oneself, one minute to take a breath. Our perfume sticks with their «slide-therapy» …touch your skin and connect to the essential… our humanity which, under this caress of perfume reconnects us to our senses, in the simplest of ways. In search of emotion, an ultra sensorial slide that awakens our epidermal molecules. Here we are in communication with ourselves, sometimes also with others, by the game, the gesture related to the perfume. A slide to re-connect, express, be romantic or tribal, be academic or invented, composed or psychedelic, always ultra sensorial and never random. A nurturing slide of perfume in the hollows, in the full, rigorous in acupuncture points, audacious and mischievous on the wings of the nose, effective and liberating near the temples and at the roots of our hair, every millimetre of our skins gently calls for these slides of fragrance, calls for the unctuous and generous care that composes each fragrance… then the olfactory molecules trace their organic wave and envelop our momentary canopy. A slide of perfume just for ourselves, in front of the mirror ending with a smile to oneself and often closing your eyes. A slide of perfume leaning toward each other like a silent messenger. A slide of perfume on our other as if to open a dialogue. A liberating slide of perfume that prints its olfactory trace, invisible, sensitive, ultra-sensitive-sensual, archi-sensual, redeeming our day, link between oneself and mainly oneself but surely also with those we love. A few seconds for a last slide, in front of life, in our redesigned light, oneself imperceptibly re-modeled with an assured energy, strong and soft and intuitively happy! Development in the closest way possible to our global ecosystem with deep respect for all things living and their cultures. In recognition of know-how : artists, craftsmen, cosmetologists with whom we work and encourage an artistic approach . A fundamentally innovative posture , a permanent mind set for improvement. Listening to the world and the upheavals that transform it in order to offer excellence and beautiful beauty products from which we take pleasure in using. An ingrained taste for transmission drives us and fosters a close, fulfilling collaboration for everyone. And above all, every day, stay the course of this so stated DNA so as not to stray away from our core values ​​.